Using a sharp knife, peel and cut the orange into segments. Place in a food processor with the remaining marinade ingredients and blend until smooth. Season. Transfer to a large mixing bowl and add the pork. Mix well, cover and refrigerate for at least 2-3 hours, preferably overnight. Thread a mango cube onto each of four metal skewers. Add the pork pieces and top each skewer with another mango cube. Cook under a preheated grill or on a barbecue for 4-5 minutes on each side or until the pork is thoroughly cooked. Serve hot with a crisp green salad. Replace the mango cubes with pineapple. As an alternative marinade, mix together lemon juice, honey and jerk seasoning. 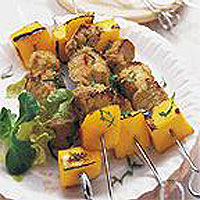 Brush over the pork, thread onto skewers and grill or barbecue until thoroughly cooked. This recipe was first published in May 2000.